Hi everyone! I'm bringing in the weekend with my first denim-on-denim look. Yes, you read that right, my first! So be easy on me:-). Personally I've always been more drawn to denim-on-denim looks that are styled with contrasting washes. I've seen many fashion bloggers go the other route and match exact washes very well. I definitely would like to try that one day, but for this particular look I wanted to mix my washes. I split up the washes by wearing darker denim on the bottom and medium chambray on top. 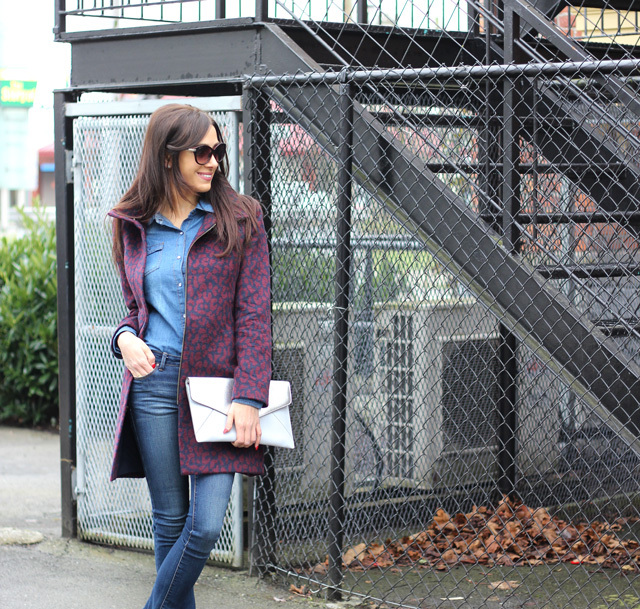 I layered with a statement leopard print coat to stand out against the denim-on-denim. I think a statement coat serves as a great way to help break up the look up even further. You can incorporate any statement coat that represents your style best! The one I'm currently wearing is from LOFT and I recently got it on sale for $120. Unfortunately, it's sold out online, but you might be able to find it in-store still:-). To finish off the look I added a metallic silver clutch, burgundy/black cat eye sunglasses, and black and white mid pumps, for a sleek, modern look. What do you all think about denim-on-denim looks? Would you rock it? I know many people are afraid to try it. However, I think if done right it can look really chic, fresh, and trendy. I'm definitely looking forward to trying more denim-on-denim looks in the future for you all. Wow, first time I've seen denim on denim look good! Well done! Thanks so much! Glad you like the look:-). Hope ur having a great week so far! Normally I try to stay away from denim-on-denim because I know it doesn't really look good on me, but I like the way you paired it with printed jacket, I think it looks very put together! Thanks so much Samantha! Was a little worried at first, but I think a statement coat acts as a great way to finish off the look. I'm sure you could still manage to rock it perfectly:-). Thanks so much Viviene! It's definitely a fun look to put together:-). Hope ur having an awesome week so far and thanks so much for stopping by! I'm loving this look! The denims are just different enough that they work really well together. That coat is awesome too! 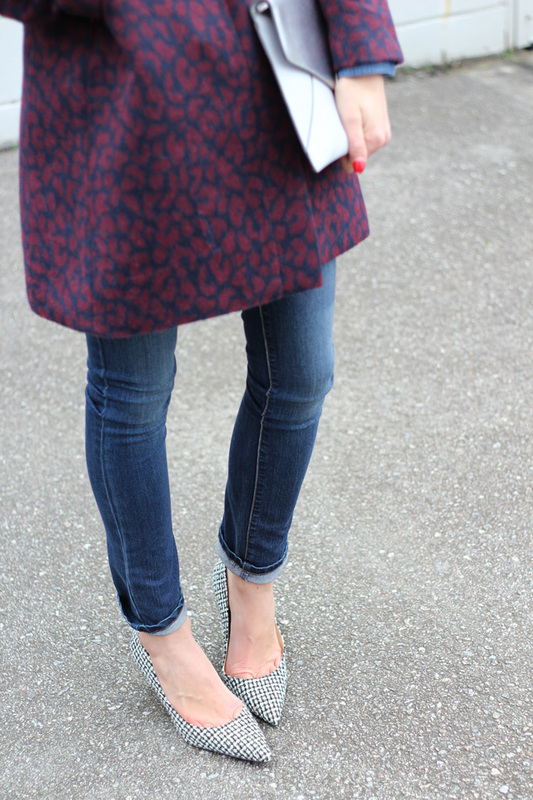 Love this denim combo with the printed coat! Looking great, girl! Thanks Jeanie:-) Printed coats are always so fun to wear! That outfit is just perfect, I love the denim on denim effect! Denim on denim perfection! Love your clutch. You rock the denim on denim so well Ela! So chic and flawless babe. I love to mix the washes up too. I always thought it looked better. Your coat is gorgepus too! In love. Thanks Amanda! You would rock the denim on denim look:-). I'm really glad I got the statement coat to finish it off. I love what you did with denim on denim. That printed jacket is just stunning! I especially love your shoes. I've been browsing through your past looks and I genuinely love your style! Following you on bloglovin' and looking forward to seeing more. Thank you Sabrina! The shoes were a last minute find and I'm glad I found them. Also got a crazy deal on them:-). That is so sweet of you to say and thank you so much! That just made my day! Hope u had an awesome weekend! You are looking so beautiful, love your outfit! Such a cute look! Love this jacket! So nice! This outfit is amazing! Perfect pairing love! What a fabulous pieces that look even better combined like that. Love this denim-on-denim outfit. I think how you mixed the washes is perfect. I've been eyeing everything in that leopard pattern from LOFT for a while -- so I'm definitely loving that jacket! Thank you Vanessa! It's such a great statement coat, unfortunately it's sold out online, but I've still seen it in store:-). Hopefully you end up getting a similar one! You did awesome with this denim-on-denim look! I have zero idea how to pull that look off! And your coat is gorgeous! Love this coat with denim on denim! Gorgeous! I agree, denim on denim works best in different shades. You're pulling it off effortlessly! Love this look. Love the denim on denim look and you look fabulous! I love the heels you are wearing as well!! That chic coat is so adorable! From the cut to the print to the colors..so cute! You look so classy and I love how you paired it with a structured clutch and pointy toe heels! So pretty! Hope your week is off to a wonderful start! Thanks Lauren! You're so sweet. Hope u had a lovely weekend and thanks so much for stopping by! You look amazing. Love the coat! Love your coat! The color and print are beautiful! Thanks Lauren! You're always so sweet. Hahaha oh u know I can take a little joke:p lol. I LOVE a good denim-on-denim outfit! This one is seriously adorable and your coat is gorgeous! This is the perfect denim on denim look, especially with that gorgeous coat to contrast your blues! This is my favorite look of yours! You did perfectly on your denim on denim look. I fell in love with this coat when you posted it away back and am obsessed! Elizabeth, you're so sooo photogenic! Always love looking at your photos! Awe thank you Paulina! You're too sweet haha. Hope u had s lovely weekend and reedy to take on the week! that coat is perfection! darling winter style! I love this jacket! You look so gorgeous!!! Have an amazing weekend! I simply adore this pairing, Ela! The denim on denim is perfect in itself, but with the addition of that unique and fabulous leopard printed coat and printed pumps, you've created something really special and totally elevated the Canadian Tux :) Thank you so much for sharing, I definitely feel inspired by it! I hope you're having a wonderful week so far, beautiful! Thank you Jalisa! That means so much coming from you!! This is actually my 1st statement coat and I'm so glad that I made the purchase. I hope u had an awesome weekend Jalisa and ready to take on the week:-). I would love to see u try the Canadian Tux look! Perfect denim on denim look. Love how you added leopard print coat and gave this look nice twist. Thanks Rita! The shoes were actually a last minute purchase and so glad I got them. Thanks so much for stopping by any have a great week! Thanks Faye! Appreciate the kind words:-). Have a great week! I am a fan of denim on denim, looks effortless and chic! Love this leopard coat, a standout and also the location! Thanks so much! It's definitely a fun look to play around with:-) Hope u have an awesome week! Love denim on denim and the coat is so fab too! You look gorgeous, love! I love this ensemble, especially the pops of color in your nails and coat! Great post babe. The pictures are awesome. I need that coat. Looking great love the denim on denim look, and you picked the perfect coat to go along with it. I also love you shoes they look very comfy. Thanks so much Ela! I never use to be a fan of it either to be quite honest and I think it's a trend that grew on me over-time. Have a great week! I love your mixed washes honey and this is the look I could totally adapt. Being a huge denim addict, this look is so up my street. Loved how you added that beautiful leopard print coat and those gorg shoes. It completed the look so perfectly. You are so beautiful, sweetheart. Hope your weekend is going really great!! Thank you Nadia! I know you would look so good in the Canadian Tuxedo. The shoes were actually a last min find and I'm so glad I got them because I just love the way they look paired with the coat:-). Thanks so much for stopping by Nadia and have a great week!